This nigiri sushi is made with a mound of specially prepared vinegared rice and layered with a thin slice of flame-grilled Tasmanian salmon that has been cooked with a blowtorch. It is then topped with Sushi Edo’s housemade teriyaki sauce. 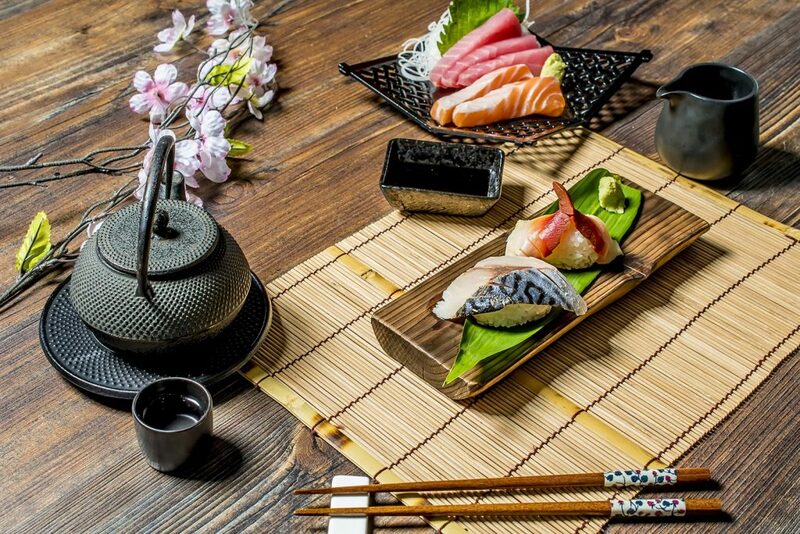 Introducing the elegant and exquisite flavours of Japanese cuisine. With its rich history, Japanese cuisine has been refined over centuries to create elegant and exquisite flavours and textures. Celebrating seasonal produce, traditional Japanese dishes focus on food eaten as fresh as possible, as this is considered the ultimate way to eat. Fresh fish are eaten raw or lightly pickled, while produce is often only lightly cooked. While Australians have four annual seasons, Japanese chefs consider dozens of different seasons and carefully select ingredients that are in their prime and best represent that specific period. This is a defining hallmark of Japanese food. Japanese chefs also rarely mix different food types, with sauces and condiments normally served in separate dishes. Meals are mainly based on rice served with miso soup and other small dishes, like seafood, fish and vegetables. Seafood and vegetables can also be deep-fried in a light batter – this is called tempura. Other Japanese staples include noodles, such as soba and udon. In the past, Japanese people did not eat meat, but with the modernisation of Japan, meat-based dishes are now easy to find. In recent times, Japanese food has also been influenced by foreign food like Chinese ramen and fried dumplings, as well as foods like spaghetti, curry and hamburgers. As well as exquisite flavour, Japanese food is presented in a visually beautiful way, as this is an essential element to Japanese cuisine. Sushi Edo is a Japanese restaurant that puts out a wide range of high-quality and fresh sushi in both traditional and innovative iterations.